Do you love Coffee, or know someone who does? 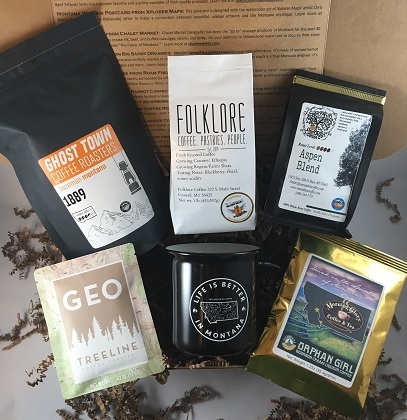 The Montana Coffee Lover's Box is the perfect gift for them, or you! The Montana Coffee Lover's Box includes an 6 oz. bag of Ghost Town Coffee Roaster's "1889" blend (Bozeman), a "Life is Better in Montana" 16 oz. ceramic coffee mug from The Montana Scene (Bigfork), a 4 oz. bag of One & Ten's "Aspen" Blend (Ft. Shaw), a 8 oz. bag of Ethiopia Shara from Folklore Coffee (Conrad), Basecamp Blend Geo Coffee Packet from Treeline Coffee Roasters (Bozeman), and a 1.25 oz. pack of Morning Glory Coffee & Tea's "Orphan Girl" Bourbon Cream Liqueur Coffee Blend (West Yellowstone). **This box is separate from the monthly subscription, and can be shipped anytime. We use USPS 1-3 priority mail, and generally ship your box 1-3 days after you place your order. Contact us if you have any special instructions!